! This is NOT a method of direct communication with KING WILLIAM FLORIST for purposes of ordering or rectifying problems. Great Job Ladies! All I know is that the birthday girl said, it was the nicest arrangement she'd ever gotten & sent me a picture! Thanks for a job well done! The woman that I spoke to on the phone was very pleasant and helpful. The recipient of the flowers said they were beautiful. As usual my flowers are GORGEOUS! Delivery ladies were friendly and professional and of course y’all are amazing!! I received the most beautiful flowers from my daughter delivered by King William florist. Beautifully put together. Very fresh and I love that it's a women owned business. Its obvious in the attention to detail! Thank you for your excellent service and the phone call took it over the top in customer service. I was most appreciative that you delivered on Christmas Eve. I placed my order, asking for delivery the day before Thanksgiving, but didn't give the right address! This delivery was going to a Special Convalescent friend unable to go home for the Holiday. By the time I reached KW florist they had closed, but they actually made the delivery anyway ... Thanksgiving Day! They always do a Great job, but this one was definitely above & beyond! All I can say is God Bless Them! Easy website to use. Delivery as promised. Very good service. Gorgeous as always! I loved them! 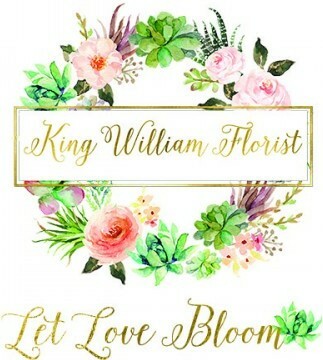 King William Florist delivers gorgeous flowers that last. I sent my mother in law flowers and they lasted 2 weeks. Always great customer service too!! Easy ordering! Prompt delivery! And the recipient loved them! All around great experience! The flowers were beautiful. They were ordered by my daughter in Ireland and came as such a lovely surprise. The entire arrangement was lovely. Quick & easy online to order, thank you for your prompt service. The arrangement was beautiful, as shown online. I will continue to deal with King William Florist. Thanks!!! Very with pleased with the online service and the ease of making the purchase. Friends that received the flowers indicated flowers were beautiful and remained that way for sometime. Thank you!! The recipient loved the arrangement. I received communication from the florist alerting me to slight changes made to the areangement which I thought was great. Always great service and beautiful fliers. Thank you. The flowers were beautiful and turned out exactly the way my my friend who ordered them wanted them to look. She said they looked just like the picture showed. Excellent as allways thanks ladies you are the BEST! This was my first time ordering flowers online and let me tell you the flowers couldn't have been more beautiful if I had picked them out myself. Professional Service and Exceptional Quality. Highly recommended. King William Florist always prepares the freshest, most beautiful arrangements. The care and expertise the stylists provide is clearly evident in the lovely products they produce. I truly appreciate their efforts in handling my order so well. Oh my goodness my love for these ladies! My wreath I ordered for my front door on Christmas was the most beautiful thing I have ever laid my eyes on! Been up for a month now and still just as beautiful! Thank you so much! Thanks so much Britni!!! So glad you were pleased!!! I did not see the arrangement but my sister called me to thank me and she said the flowers were beautiful. King William Florist provided the floral arrangements for my wedding on August 26, 2017. Liz and Johanna both were so attentive from day one, meeting with my wife and I, and really embracing our vision. That vision came to life on our wedding day thanks to these two amazing and talented ladies! Beautiful fall flower arrangement for my beautiful mother in hospice in Virginia. I always order from them and they always brighten my Mother's Day . Thank you ! Had an emergency change to the card I wrote when I ordered online & the lady that helped me was beyond helpful & friendly. Very happy with my experience. I love my floral arrangement! Here it is 4 days later and my flowers still look and smell fresh and they were hand delivered! I appreciate the service, whenever one orders flowers from florist in another State you never know what you're getting. I know the floral pictures are different than what you actually get. The HOT HOT HOT picture was different. Overall I was pleased and will use King William again. Great customer service. This is the second wedding that King William Florist has done for my family in 7 weeks! Liz and Johanna have the ability to capture the bride's dream and turn into reality. The attention to detail and design helped to turn the vision into reality. Thank you both so much for your attention detail and for making each wedding absolutely gorgeous! I ordered a Blooming Azalea to be delivered to my sister in law and brother. It was on the weekend and they choose to wait until Monday to deliver so a fresh plant would be delivered. They let them know it was supposed to be delivered Saturday. I'm very thankful for this flower shop and their attention to detail and truly caring about what they deliver and their customers. Being out of town I can always depend on King William Florist to deliver flowers for whatever occasion to my family and know they will be beautiful! Excellent service in an area that hard to send to flowers to. I really liked their selection of flowers and arrangements. 5 stars!! My husband and I worked with Elizabeth for our wedding flowers. We were under very special (and stressful) circumstances, and she was absolutely wonderful! We didn't know what to expect, but she delivered the most beautiful flowers, better than I could have ever dreamed of. Highly recommended not only for their excellent work, but their kindness as well! Thanks Lindsey for your kind words! It was so great to suprise you both with beautiful florals for your special day! Beautiful flower arrangement was sent to my mom in the hospital today! Thank you so much and ordering was so easy !! I love King William Florist. I have ordered flowers for several occasions. This particular delivery was not as fresh as it usually is. The purple flowers, not the carnations, the other purple flowers were droopy the day the arrangement was received. They did not perk up very much with water. The rest of the arrangement is fine. Thanks for asking for feedback. I hope this helps. Donna, thanks for your feedback. The Purple flower(stock) has a natural droop. I wish you had of called and I would have replaced them. I will have a new arrangement out this coming Monday. Sorry you were unhappy. Excellent. Beautiful arrangement. On time. Highly recommend. My son said the fruit was pretty and fresh and over flowing. Tk u so much. Thank you for creating such beautiful flowers for my 50th anniversary. They were lovely, and I appreciate your good work. Our party was a very special time with family and friends, and your flowers helped make it a beautiful event. Beautiful arrangement. Arrived when I asked it to be. Recipient loved it as always. The ladies at KW Florist do beautiful, quality work. I was so pleased with the arrangement that was sent to my Mother In Law. The flowers were fresh and beautiful. The online ordering was simple and quick. You did a great job on my order and I will be ordering from you when I need flowers in the Richmond area. Thank you so much for getting this right. You all went above and beyond as you always do! Thank you so much, my mother in law was not only excited about the flowers and chocolates but was so appreciative of your hospitality and smiling faces! She said she felt as if she was welcomed by family verses an impersonal agency just making a delivery!!!! Thanks for all you do and I can wait to be able to order more flowers from you and hopefully be able to stop in soon to see what other great finds you have in the shop ???????????????????? Liz & Johanna are the best! They make you feel like family when you work with them! My family & I have completed our orders in person, over the phone & online & it's always a breeze! You can see their passion in the arrangements! Always a happy customer! Liz and Johanna made 3 sprays for my father's grave and each have been uniquely beautiful. Excellent quality, color scheme and workmanship. The cost is reasonable as each seasons spray has made it through two years already! Highly recommend KW Florist. Absolutely the best florist shop around! Elizabeth and Johanna make the most beautiful arrangements, second to none. Long-lasting, fresh flowers. Always a pleasure to do business with you! Website was pretty easy to use. Prices seemed kinda high. Delivery notification was very quick. Unfortunately neither I or any of my friends actually saw the flowers at the funeral so I have to assume that they stayed at the funeral home. My store needed to send an arrangement as a condolence. We settled on a beautiful plant. Your shop was amazing!!! I called on a Friday, a week before Christmas, worried that you wouldn't be able to deliver til next week but you delivered the next day!!!! And you made sure to get it out before they had to leave!! Thank you for the personal touch. I look forward to working with you again, both as a business and personally!!! Danielle, Thank you so much for choosing our Florist to take care of your order. We look forward to working with you in the future! Thank you! I asked for the arrangement to be delivered the day I ordered it, and that is precisely what happened. I requested roses be added and they were. The recipient loved the arrangement and sent us a picture. It was beautiful! Thank you for terrific service! After placing my order online, I call the store directly due to the time sensitive nature of my order. The staff was friendly and helpful and made sure the delivery was made. The wreath was absolutely lovely. Elizabeth, you need to open a florist in West Point because the Watering Can closed because the owner retired and we only have one florist left, Margeaux's. Thanks, Kelly! We appreciate your review!!! I first met Liz and Joanna when I was looking for a florist for my wedding. They were so fun to work with and my flowers were amazing for my wedding. I was extrememly picky and they were always so sweet with my ever changing ideas. They have done weddings and events for friends and we were all equally pleased. They continue to be my favorite florists and now I am also proud to call them friends! Highly recommend!